The Business Transformation Tool has been developed to support a business in turning a new value opportunity into a new business model. It helps design change programmes to implement business model innovations and develop action plans. The tool provides a structured approach to understanding and managing complex multi-dimensional change and long-term sustainable business transformation. The tool has been used in workshops with 16 companies. For more information please contact Dr Doroteya Vladimirova . 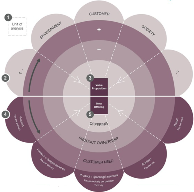 The Cambridge Value Mapping Tool has been developed to elicit failed value exchanges among multiple stakeholders in the network of the firm and uncover new value opportunities through a structured and visual approach. The tool assists in systematically analysing various forms of value in a business and network and stimulate innovation in sustainable value creation. The tool adopts a multi-stakeholder perspective, through which the exchange of value can be analysed and potential stakeholder conflicts identified to create positive value in the network. It provides a new perspective for practitioners to understand and create new economic, social, and environmental value from their business. The Cambridge Value Mapping Tool has been used in industry through a multitude of group workshops or in-house bespoke workshops. The tool is also used as teaching material at the University of Cambridge other academic institutions. For more information please contact Prof Steve Evans. Sustainable Value Analysis Tool (SVAT) is designed to help manufacturing companies identify opportunities to create sustainable value by analysing the captured and uncaptured value throughout the entire life cycle of products. Uncaptured value exists in almost all companies. Some uncaptured value is visible, e.g. waste streams in production, co-products, under-utilised resources, and reusable components of broken products; some is invisible, e.g. over capacity of labour, insufficient use of expertise and knowledge. Reducing any kind of the uncaptured value would create sustainable value. However, identifying the uncaptured value and creating value from it is not always easy. The tool supports this process, providing companies with a scheme to systematically look for each form of value uncaptured (i.e. 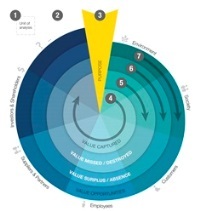 value surplus, value absence, value destroyed and value missed) at the beginning, middle and end of the product life cycle, and with a method to turn the identified value uncaptured into value opportunities. The SVAT has been well received in 25 manufacturing companies across various sectors and of various sizes. It helped them find opportunities to create value internally and to discover the potential of creating mutual value externally. The tool has also been used for other purposes such as research, consultancy, business education and university education. For more information contact Dr Doroteya Vladimirova.